Within the last week I have started using Yammer, a version of Twitter designed for companies. Yammer is based around the question of “What are you working on?” and the concept of only allowing users from the company's domain (e.g. domain.co.nz) to signup. This provides for an interesting closed community where people are willing to ask questions and have discussions that would not be appropriate to a public community (e.g. "Simon and I are hitting the ABC requirements hard this month... any suggestions/recommendations?"). It has been interesting to watch the viral infiltration of Yammer throughout the company. As people register they are prompted to enter in who they work with @domain ; an email is then sent to these people requesting them to register. Similarly a user can add Org Chart information such as boss, staff, assistant and these people will be sent an invitation to register. Unfortunately the invites are currently marked as Spam by our email system so many people will not be finding their invite that is residing in their Spam folder, but word of mouth is helping to get people onboard. A number of the people who have signed up to Yammer have not used Twitter or a similar service before, so the concept is new to them and they are feeling their way as to what is appropriate to "yam" (I don't know what the offical term is to send a message on Yammer, but this sounds appropriate) about. It will be interesting to see how people end up using Yammer (if at all), and then whether somebody tries to close it down as not being an official internal communication tool for the company. The Adobe AIR based desktop client is currently a bit too limited in functionality, but according to the Yammer User Forum an updated tool is on its way. I really like Twhirl for Twitter and have been using this for a while so any other client really needs to match this imho. Ideally I would like to be able to use Twhirl with Yammer. Some additional functionality of Yammer is available at the cost of US$1 per user / per month, which whilst this might be suitable for a small company, the cost for a larger company will possibly be hard to justify. This is Admin functionality and includes being able to brand Yammer with your company's logo, ability to restrict access to IP address ranges, implement password policies, ban users, delete any messages and delegate Admin functionality. If this cost makes you cringe or you would like to host a Twitter-like solution yourself, laconi.ca might be suitable for you. 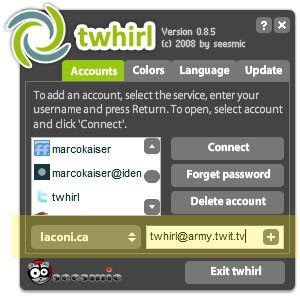 With the beta version of twhirl v0.8.5 laconi.ca is also supported as a client. I think this makes a very attractive alternative for corporates. 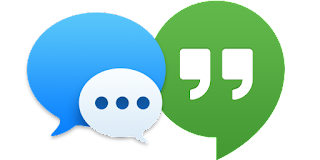 The next big question in my mind is, "When will Twitter release group and company-centric functionality?" I think moreso the question is when will Twitter buy Yammer?